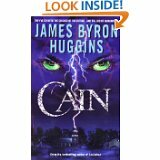 One of the most powerful, shocking and insightful science/horror novels I ever read was CAIN by James Byron Huggins [former soldier, cop and award winning journalist] from Alabama. This was a 1997 copyright novel [hardcopy] that I don’t think ever came out in paperback for U.S.A. distribution, however; was released hardback and paperback thru Amazon http://www.amazon.com and Amazon still has some older copies from sellers. I waited since 1997 for the book to turn into a movie but it never happened. This was a most incredible story ever wrote and including the spirit/supernatural LINK with a giant invincible humanoid dug up by the CIA and then rebuilt by science ~ they rebuilt soul-less flesh and transformed it into a killing machine, a villian whose power for evil is unmatched in this world, at this time…..! A wounded god in the Middle East, dug up by an Israeli researcher in a portal ~ ‘he’ had never seen light through mortal/human eyes, but now ‘The mortal fools succeeded’…..! AND who would try to stop the UNSTOPPABLE ~ Soloman, a soldier who lost his family, his will to live; Marcelle, a priest who had lost his faith; and Dr. Maggie Milton, the beautiful young scientist who unwittingly helped to unleash CAIN on the world. NOW, in December, 2011 ~ I received word that Bruce Willis has bought the rights for the book CAIN from James Byron Huggins and is working on this for a movie……! Now in my estimation James Byron Huggins is clearly in the ranks with Dean A. Koontz ! Larry, I don’t need my blood to run colder by reading this. I am already all too aware of evil. It’s good to know, though, that Bruce Willis is going to try to produce this thing. I admit the knowledge needs to go forth. support at this time, or seriously thinking of retreating and stopping publication on the internet. Such as Richard Coombes of A and O Report, who has been running month to month and now day to day, and others we all know of. I know some so-called human beings whose “eyes” have never seen as humans born of the Spirit ever do. Plenty of those out there without the dug-up ones. Thanks Larry! A used one for 3.49 plus $3 for shipping is a present I could afford to buy myself for Christmas! God bless you and Amazon….and thanks as always!